OG Kush Seeds along with Sour Diesel are probably two of the most famous, and most popular Marijuana strains currently in circulation in the United States of America. The origins of this Kush come from the original Marijuana land-race strains that grew in Afghanistan, Northern Pakistan and parts of North-West India. Part of the name OG Kush is taken from this area, the Hindu Kush Mountains. Various types of Hindu Kush were brought to America from the mid 1970, and through carefully selected breeding patterns, the OG Kush was born and is still just as popular today. OG Kush produce Marijuana buds that a very distinctive flavor. If your smoking OG Kush and it does not leave that sour, citrus lemon taste on your lips, than man, you are not smoking the OG! At 18% THC this smoke kicks in like an F1-11, MAN IT KICKS FAST, and with it’s super lemony taste and odor it soon lets the rest of the party know…”Hey, i’m smoking the OG Kush” know what i mean! It is no surprise to learn that the British pharmaceutical company, GW, used OG Kush when it was conducting it’s own medical trials. 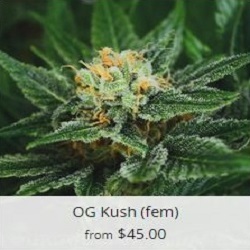 When grown correctly, OG Kush has one of the highest THC contents of any of the Kush Marijuana strains. It produces a “hit” rather than a “high” and has been likened to a shot of expresso, strange i know, but this baby does not make you sleepy, unlike many other Marijuana strains. No, instead the OG is the perfect day-time smoke. Combined with it’s pain killing effects, OG Kush wakes you up and relaxes you at the same time, perfect medical Marijuana for many ailments. However, it is not recommended to smoke the OG before bedtime, as it has a tendency to speed up the heart rate and keep the user awake. That said, a by-product of an increased heart rate is that it pushes oxygen around the body faster, allowing your muscles more oxygenated red blood cells, so if your going to bed with your wife, partner or girlfriend and want a smoke that keeps you stay up, ha ha, then the OG Kush sure can help you there. When it comes to the OG in OG Kush many people want to know exactly what the OG in OG Kush stands for and where did that part come from, so here are a few explanations that i have been given on my travels as with VegPage. According to the “Rappers, and street gangs of California and L.A. the OG in OG Kush stands for Original Gangsta. Referring to it’s parentage of being an original Land-race strain of Cannabis that was imported into America and then subsequently improved to be the very best of it’s strain. My guess is one day a guy grew it and called it Own Grown Kush, this was true, as he probably grew it himself, but hey, how could the dealer then call it Own Grown Kush, after all he did not grow it, and probably didn’t want his customers to think he did, so what does he do….”Hey man, got some mighty sweet OG Kush here” It’s just as likely as the other reasons i have been given. When it comes to OG Kush, one thing we can all be sure of is it’s quality. Ensure you buy genuine and reputable OG Kush seeds from the best Marijuana Seed distributors currently on the internet. Do not trust some of the cheap copy seed companies, you will only be ripped off. VegPage recommend’s one the most established OG Kush Marijuana Seeds Bank.